Saying No is a big problem to some of us. Even when we know, it is not going to benefit us and in some cases, going to cost a bomb, we agree to help and say Yes. The problem is that we are hardwired to say Yes, being nice and approachable. We have been taught right from our childhood, every No is a missed opportunity to bring some change and develop a life long relationship. It is true to some extent because if we are going to say No to a wrong proposal and person, it may backfire and cost a bomb to our repute and future prospective. Again, we do not want that. Here I am not asking you to say No to everything. 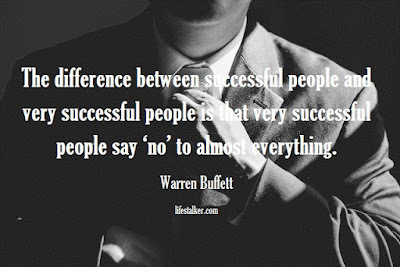 If you re-read the quote, you will find that I am asking you to say Yes to select few things. You need to learn that there is a big difference between pleasing and helping. For example, One of your friend wants to buy a new cellphone, and you lend him money, this is people pleasing. On other hand, one of your friend has had emergency and need money for hospital bills, and you lend him money, that is helping. In first case, if you do not lend money, it will still workout but if you don’t lend money in second case, it might backfire you. Listen to them with full attention, don’t interrupt them while they are talking, and when they are done, with a smile on your face, simply say No. That’s it, all you need to simply put it straight with a smile. And it will work like magic. By any chance, they are still nagging you then simply say, you can’t because you need that thing. They will not bother you when you put it in this way. Explain your priorities and current situation that you are stuck in middle of something and you can’t help him out. Explain your situation politely, so it won’t hurt your relationship. Assure them that you will help them as soon as you are free.